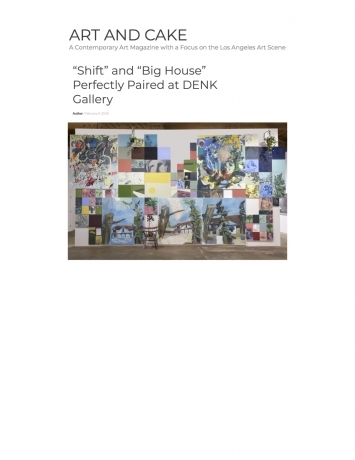 (Los Angeles, CA) - DENK gallery is pleased to announce Shift, a painting exhibition featuring new works by Los Angeles-based artists Karen Carson, Kim Dingle, Iva Gueorguieva, and Elisa Johns. 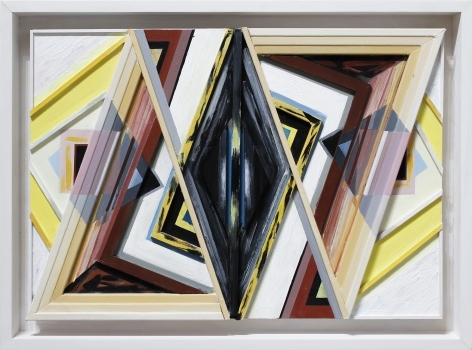 Each of these four painters is unique in her simultaneous exploration of both abstract and representational genres. 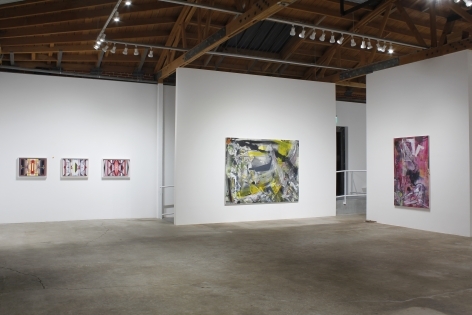 This show will present new and recent pieces by each of the four painters, focusing on the often ambiguous transitions in their works and practices from the referential to the abstract. 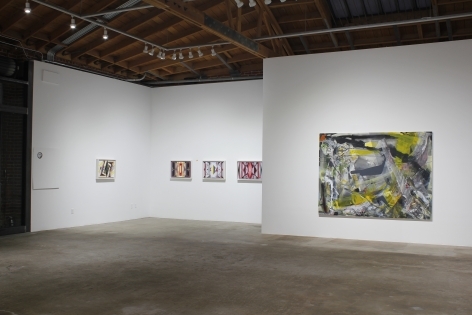 Karen Carson's work has ranged from the figurative to the gestural and has included everything from large-format depictions of giant tractors rendered with the seductive lure and precision of the fetish, to liquid landscapes and energetic abstractions of nature's elemental forces. 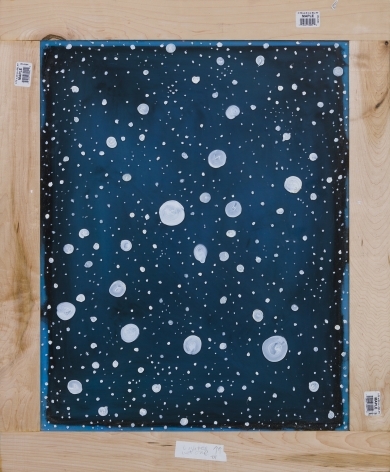 In her current series of bas-relief paintings, Carson creates optically complex pieces that transition and 'flutter' from flat to dimensional impressions of space. Through a combination of bright jewel tones, black lines, and negative white expanses, a graphic flatness extends and undulates subtly into space. These seemingly simple abstract geometries belie their refinement and composure, offering, in the artist's words, "a certain modesty meant to contrast the bombastic and cruder elements of our current society." 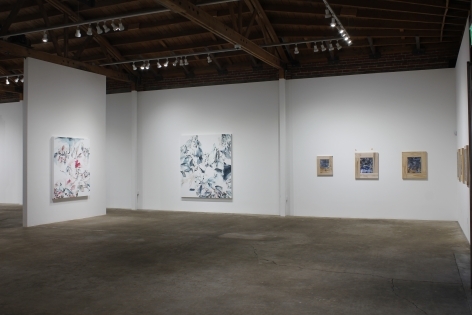 Karen Carson’s artworks are in the permanent collections of the Los Angeles County Museum of Art, CA, Santa Barbara Museum of Art, CA, Nora Eccles Harrison Museum of Art, Logan, UT, Museum of Contemporary Art, Los Angeles, CA and the Long Beach Museum of Art, CA. Kim Dingle is best known for her loose, figurative works depicting stylized, caricatural children in a variety of adult pantomimes, ranging from the playful and innocent to the abject and grotesque. Sporting exaggerated signifiers of gender like frilly skirts and ankle socks, these hyperbolic, and often darkly adult, personifications of libidinal behaviors are strikingly iconic and immediately recognizable as her own. In Shift, Dingle presents a series of loose abstractions from her Nature Series, that, in spite of their diffuseness, remain connected to the world of the referent and even to that of the body, through lush, corpulent brushstrokes and ambiguous circumscriptions of contextual space. 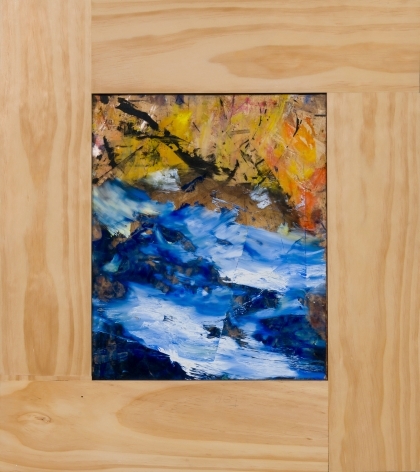 Her choice of prominent maple frames, integral components of the works, ground the pictorial space in the referential, asserting its presence as object. 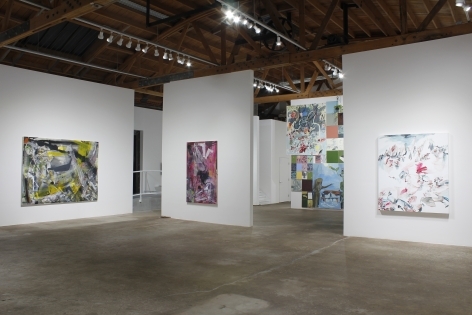 Dingle's work is represented in several public collections including, the Denver Museum of Contemporary Art, Los Angeles County Museum of Art, Museum of Contemporary Art, Los Angeles, Museum of Contemporary Art, San Diego, National Gallery of Art, Washington D.C., San Francisco Museum of Modern Art, Seattle Museum of Contemporary Art, Smithsonian American Art Museum, Washington D.C, and the Whitney Museum of American Art, New York. 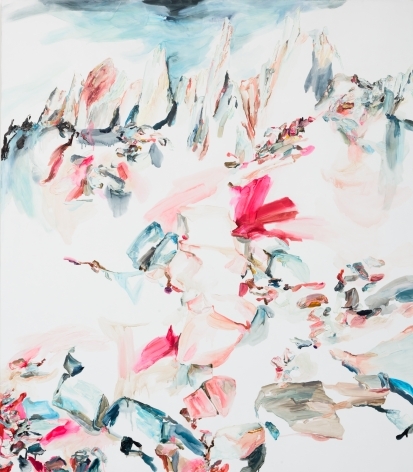 Iva Gueorguieva's energetic abstractions are frenetic and charged. The allusions to figure and landscape in her work are posited in a state of perpetual becoming and undoing, presented as entities in a constant state of flux. 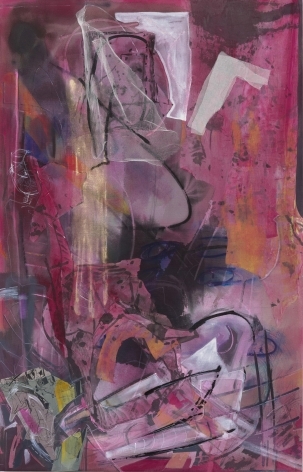 This Instability and tumult of her imagery are both destabilizing and seductive, as the dynamic push and pull within the pictorial space keeps the viewer in a state of active searching and itinerant viewing. 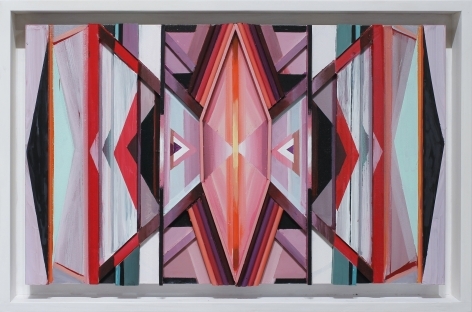 Anxiously redolent, these paintings seem to harness the very energy of the touch with which they were made. 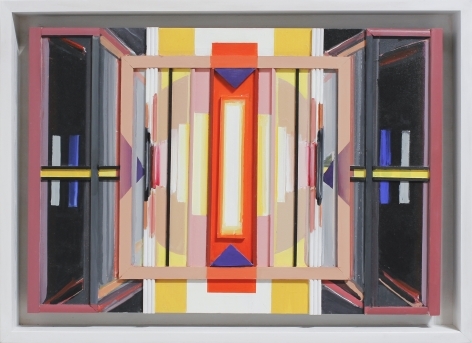 Gueorguieva's work is included in several public and private collections, including the Los Angeles County Museum of Art, the Minneapolis Institute of Art, Museum of Contemporary Art, Los Angeles, CA, University Art Museum California State University Long Beach, CA, Art, Design and Architecture Museum at UC Santa Barbara, Santa Barbara, CA, and Pomona College Museum of Art, Claremont, CA. 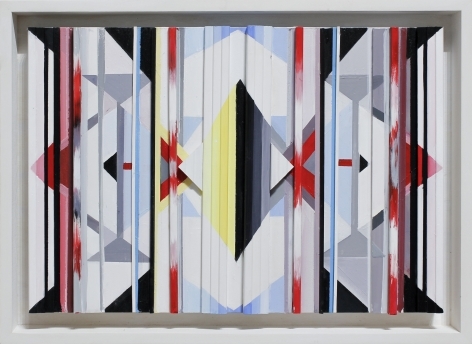 Gueorguieva is represented by Miles McEnery Gallery in New York City, NY, and Frederic Snitzer Gallery in Miami, FL. Elisa Johns' works look to nature and the Western landscape, depicting its forms with varying degrees of abstract stylization. 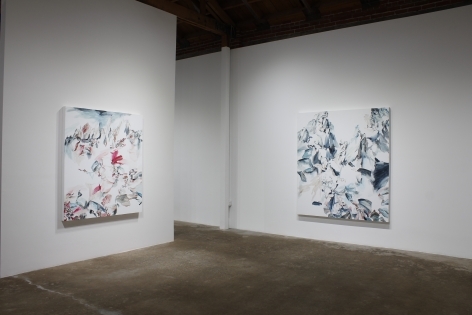 Choosing areas of any given observed environment to highlight, she uses her distinct brushstrokes, often reminiscent of ink calligraphy, to reduce and outline the masses of mountains, flowers and extending horizons that appear in her work. 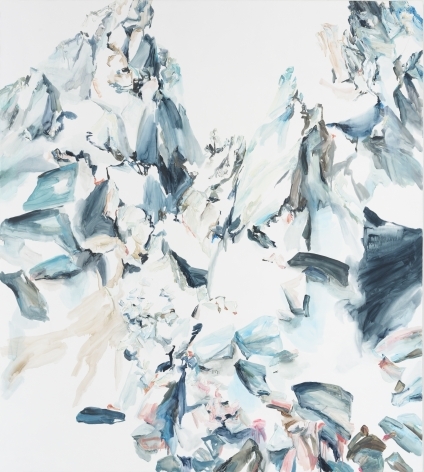 Allowing a great deal of negative space to frame her mark making, Johns emphasizes the poignancy of each gesture, and by proxy, the immediacy of nature. 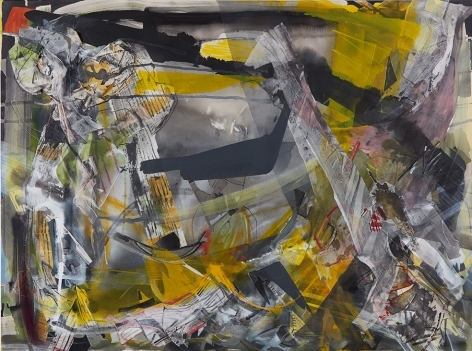 Controlled and yet open, her paintings slip evocatively in and out of recognizable and abstract terrains. 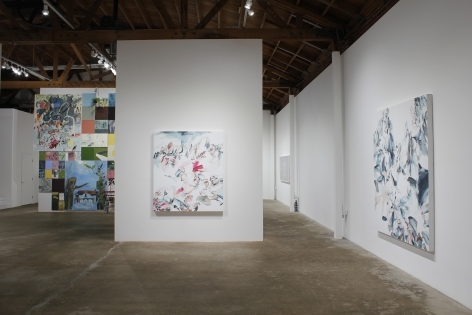 Johns received a BFA from University of California San Diego and an MFA from Claremont Graduate University.